Recently, it’s growing faster than ever, which prompted me to write this post. I want to share with you how to grow your Instagram following. If you are a blogger, influencer, small business, or just want more followers on Instagram, use the steps below to grow your Instagram following. Your content matters on Instagram. 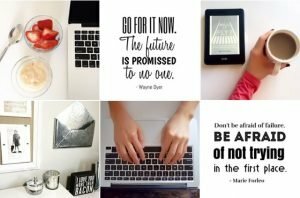 Are you going to post photos of “behind the scenes” of your blog / business, or are you trying to help people? Are you posting about your life or your business? Decide these questions ahead of time and stick to them. Consistency matters. It’s really important that your Instagram feed looks good. This is sort of obvious. But implementing it is hard. To make sure your feed looks good, schedule your posts with Planoly. This is the one thing that I started doing recently that is life changing for my Instagram. Planoly allows you to see what your photos will look like on Instagram ahead of time. So you can see what your feed will look like in advance (and adjust accordingly). My feed before using Planoly was stagnant. I couldn’t find ways to take photos in my day to day life and have it be a cohesive brand. I kept it pink, teal, black, and white for the most part. This made it hard to post photos of things I was actually doing. It made posting around the holidays difficult. And I always had to be thinking about how to take the same pictures in different ways because I wanted them to all look alike. After using Planoly, I was able to create a cohesive feed that fits my brand while allowing me to take photos in my day to day life. This not only makes my feed look better, but it’s soooo much easier for me. 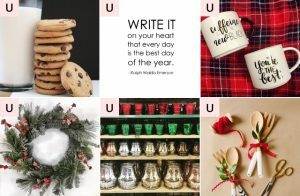 I have photos planned out for the holidays and it was so easy! Aside from being able to see your pictures ahead of time, you should use balanced lighting, alternating between light and dark. Your photos will pop more if you have a light photo next to a dark photo instead of multiple light photos in a row. Finally, think of your feed as a magazine. It should have a cohesive brand look. This may mean sticking to certain colors, or a certain feel. Limit filters to only 1-2 for all photos. I tend not to use filters at all, but if I do, there’s only one I ever consider. The more regularly you post, the faster your followers will grow. Aim for once a day. I tend to break this rule and go to three times a week, but I stay consistent (and I only break it because I don’t have enough photos for once a day!). Use Planoly analytics to determine what’s the best time to post. For me it’s early am (like 5am!) and during the week is better than weekends for me. Figure out what the best time to post is for you, and consistently post then. Comment on other Instagram pages in your niche. Use thoughtful comments. This is a huge driver of getting a bigger following. People will see your comments and follow back. Another way to engage with comments is to use comment pods. A comment pod is a group of people in a group message on Instagram that agrees to comment on everyone’s posts in the group. You send an emoji to the group to alert the group that you’ve posted, and then they comment on your post. You then comment on their posts when they send and emoji to the group. It’s also important to reply to your comments as soon as possible. The Instagram algorithm will notice higher engagement and put your post higher up in the feed. Use hashtags in your niche on each post. Search the web for which hashtags to use. However, be careful that the hashtags you choose aren’t shadow-banned. This means that Instagram now considers these spammy, so it’s ignoring them altogether. To know whether a hashtag is banned, click on it and see when the last time someone posted on Instagram with it. If it was seconds ago, then you should be okay using that hashtag. Search for hashtags that the accounts you like and admire are using. Then, click on those hashtags and see if you like the types of photos that come up. If you do, then consider using it for yourself. Also, create a hashtag for your brand. It may seem a bit narcissistic, but it’s not. I am now using #NatalieBacon on my photos, for example. This helps people find me and find my photos. I adjust (remove and add) hashtags based on the specific post. Obviously, I don’t use the quote hashtag if it’s not a quote. There are tons of posts online that talk about which hashtags are trending and which are most popular within certain niches. Use those posts to guide you as to which hashtags you should use. 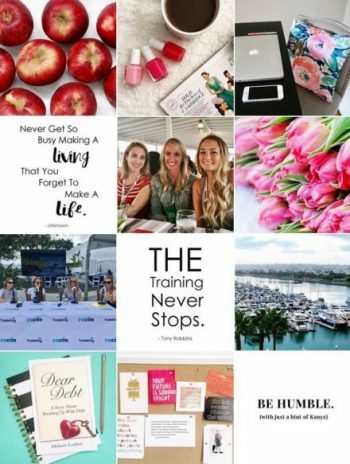 Join Facebook groups specifically for social media and Instagram. The benefit of this is that you will make connections with other bloggers and influencers who will discuss strategies for implementing growth. You’ll also make friends to the point where people will start asking to include you in comment pods or giveaways on Instagram. Focus your Instagram feed on serving your audience. Whether you’re providing behind the scenes content or help in a specific area, think about what your audience wants to see and read about. Avoid being self-serving. If you’re posting about your personal life, find a way to make it applicable to your readers. For example, I have a note saved in Evernote called “Instagram Feed Inspo”. In the note, I list my purpose for my entire Instagram feed. For me, each post should be helping people with money, career, or lifestyle choices, or showing my readers how I’m doing each of these things. Having this note helps me stay focused and not stray into random things that my readers won’t care about. Stay focused on your main topics, speaking through a voice unique to you. Connect with your audience and build your tribe authentically. Be the best you can be, providing value to your readers and people will follow. Using these steps, I’ve grown my Instagram account to over 5,000. The more I abide by these rules, the faster my account grows. Really valuable info Natalie! This may sound ridiculous but I think I am going to print out this post for reference haha. I have been wanting to grow my instagram audience for a while now and this give me something tangible to try out. What’s your thoughts on bots? I tend to think that if it’s done correctly, instagram bots can be useful engagement tools. E.g if you set the bot to like similar posts to yours you will find your engagement goes through the roof! But things like spamming comments are just obnoxious. I used a third party company for a while but over time I didn’t feel like it was worth it because actual engagement didn’t increase. Hi Natalie, thank you so much for creating this list. I had no idea where to start with my Instagram account. When I signed up for Planoly I realized how all of my photos are super dark (and random subjects..oops). Do you think there is an ideal number of hashtags to use per post? I’ve also read somewhere that it’s better to keep your hashtags in a comment instead of the description of the post. I’d love to know what you think! Thank you so much for this post! I have recently started a blog and am trying to grow my social platform so this is exactly what I needed to get going in the right direction! I love your posts! I just finished reading your ebook as well. It makes me motivated to try all the things you’ve written about (so many tabs open). I’m a new blogger so this really helps me out, I really appreciate the knowledge. Thank you so much! Thanks so much, Sammy! Sending you lots of good luck!